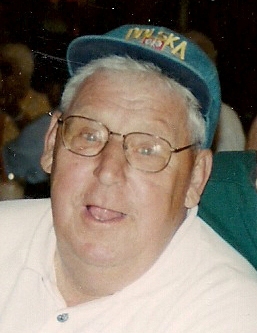 Mr. Paul "Pope" Dry, age 83, formerly of South Main Street, Salamanca, New York died Tuesday, June 21, 2011 at the home of his daughter, Debbie Kopp , Maquoketa, Iowa. Born on January 16, 1928 in Salamanca, New York he was the son of the late John & Agnes Ambuske Dry. He was married on November 16, 1953 to the former Lucy Truman who predeceased him on February 11, 1993. He was a veteran of the U.S. Navy serving during WWII. He was awarded the WWII Victory Medal and the Good Conduct Medal. He served with the Naval Reserves until 1954. Mr. Dry was employed on the Erie-Lackawanna Railroad as a Supervisor of the Bridge Crew prior to his retirement. He was a member of the former Holy Cross Church. Surviving are: 3 daughters, Vicki (Doug Mowry) Dry, Phoenix, Arizona, Debbie (Joseph) Kopp, Maquoketa, Iowa, Margo (Greg) Della, San Diego, California; Mark (Donna) Dry, Kent, Washington, Daniel (Tammi) Dry, Orlando, Florida, Randy (Linda) Dry, New Jersey, Edward (Kim) Dry, Salamanca, New York; 19 grandchildren; 2 great grandchildren; 5 brothers, Ted "Joby" (Mary Ann) Dry, Victor (Fay) Dry, David (Barb) Dry, Donald (Janice) Dry, all of Salamanca, New York, Joey Dry, Little Valley, New York; several nieces and nephews. He was predeceased by 2 brothers, Robert Dry, Thomas Dry, and a sister, Barbara Onuffer. Memorial visitation will be held in the O'Rourke & O'Rourke Inc. Funeral Home, 25 River Street, Salamanca, New York on Friday from 2-4 and 7-9 P.M.
A memorial mass will be held on Saturday at 10 AM inOur Lady of Peace Parish with Rev. Patrick Melfi, pastor, as celebrant.